I made the tastiest dinner tonight: chicken, carrots, ginger, garlic, brown rice flour and chicken bone broth, simmered and thickened so I could have it over brown rice. What was missing? The dreaded dairy, gluten, soy and sugar, now possibly permanently banned from my diet. But let’s face it – those things are pretty difficult to avoid when going out to eat. Luckily I have my pocket-sized computer (phone) with internet access because there is a new app on the market that will help take the pain out of trying to socialize over a meal that may or may not be okay for me. DineSafe is free to both the patrons and the restaurants. To participate, restaurants have to enter their menu items, which might sound labor-intensive, but here’s the great thing: they can put directly on the app which allergenic ingredients are included on each menu choice. I mean, who better would know which ingredients go into their food? This takes all of the guesswork out of the equation for the patrons. For instance, maybe you are allergic to dairy, shellfish and mushrooms; the first thing you will be prompted to do when you enter the app is plug in all of the items you are allergic to. They have such a great list pre-programmed in, including dairy, peanut, gluten, garlic, soy and eggs, that most of the common allergens are available to choose. There is also a tab for specific diets, including vegetarian, vegan, paleo and organic. The creators did not skimp on categories! They are open to suggestions, so if you think that your allergen or diet are not represented, you can give them the feedback. I didn’t see sugar on the list so I’ll be giving them that suggestion. Sugar can hide out in simple things like salad dressings, and I’d like to make the most informed choice possible when someone else is preparing my meal. The app can search for nearby locations according to your GPS position, but you can also ask for it to look in specific areas (great for when you’re meeting other people out and you’re trying to find a suitable restaurant). After all, most cultures have socialization built around meals; there’s no reason a person should have to give that up because of some restrictions. I feel like we are overdue for an app like this. Right now I see listings for the Orlando, Florida area. What’s the best way to make sure restaurants are getting on board in your city? Load the app on your phone and talk to restaurant managers about the advantages of making their menu information available online including known allergens and diets, and consumers will feel empowered about choosing their products. Lastly, the U.S. is very slow about getting on board with safety – basically it’s up to patrons to be detectives and figure out if something is safe for them to eat. The UK and Europe have already passed laws regarding requirements to disclose allergens in sit-down and take-out establishments. We SHOULD have those laws here, but for now, we have to rely on our pocket computers to guide us. I look forward to using DineSafe when it reaches my area. ****This is a sponsored post for DineSafe. ******I was excited to talk about this app and its features anyway because my life is going to change drastically as a result of having these restrictions placed on my diet. The summer I was 19 was a magical time. I don’t mean that everything fell into place perfectly and I knew what I was going to be when I grew up, but rather that I had a lot of firsts and I wasn’t burdened by disease. I had all of my beautiful, fine, soft hair and had no inkling that in four years I would be sidelined by fibromyalgia or that a weird brain disorder was looming over me. I had managed to make it through my first year at university with my virginity intact. A couple of guys had tried to talk me out of it but failed. I certainly wasn’t holding onto it for a special occasion – I did not have any grand illusions that I was saving it for marriage or anything misguided like that. But by the time I finished that first year of college, I decided to let go of a few things, including going back for a second year, as well as that nagging virginity. I moved back to Mackinac Island and lived above the busiest bar on the island – very much a departure from the “Virgin Vault” the previous summer – and there was a constant whirlwind of many, many people to meet, both workers on the island and visitors. Within the first week I was introduced to a guy who managed to get my knickers off within the second hour of becoming acquainted. At this point I just wanted to get it out of the way because I had heard too many stories about how it was painful the first time. Well, I didn’t have the experience of a hymen being torn or dealing with blood. Unfortunately, the guy didn’t believe that it was my first time because of that, and he was pretty rough (and also a bit drunk). I ended up with a lot of bruises. We went through a lot of condoms. We finally fell asleep in my bed (the bottom bunk in a 4-bed room), and I woke up in the wee hours suddenly startled by the fact that I couldn’t remember his name. I knew it was four letters, that was all. In his drunken slumber he kept elbowing me in the face while he rubbed his mug vigorously, so that was a zero sleep night. Not the best first time, but at least I got it out of the way – and thanks to his choice in seduction music, I still can’t listen to “Ziggy Stardust” to this day, even though I adore David Bowie. A few weeks later he came back for a repeat performance but I turned him down. This was the year that I became acquainted with a lot of foreign workers. Within the first three weeks on the island, I knew them all. They represented England, Germany, Austria, Spain and Portugal. I got to make out with one of the Austrians, my first foreigner. He was very relaxed with sleepy eyes and permanent pot high. I imagine he’s some sort of public official back home now, he just had to get some partying out of his system. About two months into my time on the island I did what a lot of seasonal workers did and got a second job. I was hired to be a hostess for a restaurant (now closed) and managed to also be designated as the karaoke host. For any of you that have worked restaurant jobs, you know that a lot of bed hopping goes on. This was my first foray into this business so I didn’t go hog wild. However, I did manage to catch the eye of two men. The first was M. He was tall with long, dark curly hair. 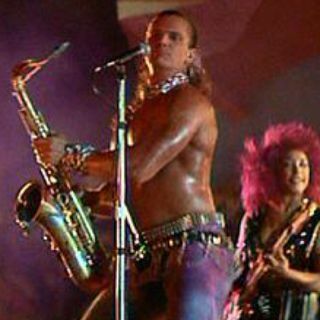 When I think of him, I think of the saxophone player with the oiled up muscles and long hair that appeared in “Lost Boys” (see the picture immediately below). M. bounced back and forth between Naples, FL and Mackinac Island to cash in on patrons parting with big tips while on vacation. Normally M. was very crabby; I chalk this up to him being in his mid-30’s and having to work with youngsters like me. But at some point he lightened up and started flirting with me, and eventually worked up to asking me back to his place. It was my first time with an older guy, especially baggage like his – he had an ex-wife from England and a baby, and he was deeply wounded from their divorce. M. was passionate and strong. He also wanted to jump into a relationship. I wasn’t so sure because he was older, he was still planning on leaving at the end of September, and I simply did not have a lot of dating experience. I still remember the walk of shame back to my apartment in the early morning. My hair was tangled, my mascara and eyeliner were everywhere but on my eyes, I was wearing the previous day’s clothes…and wouldn’t you know it, some customers I had helped the previous day were the first people to see (and recognize) me. The next night he wasn’t working, and all of the sudden a British waiter, S., became very flirty with me. He talked me into going back to his place that night. I know, I know – two nights in a row, different guys – slow your roll down! But again, I was largely inexperienced with dating and flattered that another handsome man found me attractive. S. had blue eyes and dark wavy hair, and his features reminded me of a much cuter Flea from the Red Hot Chili Peppers. He gave me a massage with the best smelling body oil I still haven’t been able to find since and we put the Sade album “Love Deluxe” on repeat to sleep to the rest of the night. S. was brooding and dark, and confessed that he was still hurt by his recent breakup with his long-term girlfriend, Jackie, who was supposed to be traveling with him while they worked their way around the world to Australia. We talked about the possibility of me taking her place and the logistics of trying to earn cash without a work visa. The next morning when we woke and cuddled, I informed him that I had been intimate with our co-worker the night before our night together. S. explained to me that M. was outright rude to him simply because his accent reminded M. of his ex-wife, and that this would likely cause problems at work, but I would have to decide between the two of them. S. was talking about a future with me; M. only wanted to forget his past. That night, all three of us happened to be working at the restaurant. M. was very excited to see me – he was dressed up and wearing cologne and a huge smile. M. and S. took turns hanging out at my hostess station and flirting but keeping away from each other. I was torn. I still cringe from this, but I finally made up my mind and told M. that I had decided to date S. M. was hurt and angry, and he had every right to be – there was no way he could have known what I was up to the night after we had been together. I am still not convinced that I made the right decision and I wonder how different things would be now if I had gone the other way. S. and I had our share of fun. One of my best memories with S. is that a co-worker offered to let us use her car to take a trip to a city two hours away from the island. S. insisted on driving first because he had made it a point to get an international driver’s license, but after a few scary turns into oncoming traffic, he pulled over and begged me to drive. We spent the day shopping in Traverse City and then headed back. The co-worker failed to tell me that her car was leaking transmission fluid. When I got to Mackinac Bridge, the fifth longest suspension bridge in the world, the car suddenly began to decelerate, despite me having the gas pedal to the floor. S. woke up in the passenger seat when cars began honking at me. He was yelling at me to stop slowing down, and I was yelling that I wasn’t doing it on purpose, something was wrong with the car. We made it across the bridge going 10 mph and ended up coasting into the first parking lot off of the bridge, which happened to be a hotel. We had missed the last ferry and so had to stay there for the night. S. did the best thing a boyfriend has ever done, which was go out and buy tampons for me at a convenience store because I was not prepared for my period to start that night. He also scored a pizza for our dinner. S. and I dated until the very end of the season before the first snowflake fell. Instead of taking me with him across the globe, though, he broke up with me. He was still hoping to reconcile with Jackie and was convinced he would see her in Australia. I still remember the day he left. The main street was very quiet and it was an overcast, windy day. I was watching out my window onto the street because I knew which ferry he would be taking, and there he was walking his slouched-over British walk with his big travel bag on his shoulder, not looking anywhere but straight ahead. I wanted to yell goodbye to him but instead watched him as long as I could before he disappeared into the ferry while I cried big, fat tears. Now that I am older and bed-bound, I lament the fact that I will never have the opportunity to choose between S. and M. again.